Have a read to find out what else I have crammed into your 7-day vacation in Bali. 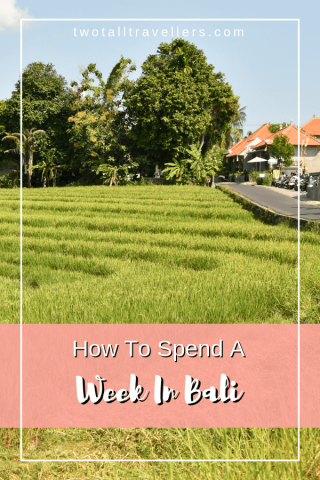 There are so many great things to do in Bali but on a short time scale like this, you need to be organised! Is 7 days in Bali enough? How much is a beer in Bali? Can I use US dollars in Bali? Do you need injections for Bali? Fly to Ngurah Rai airport as early as possible in order to maximise your time. 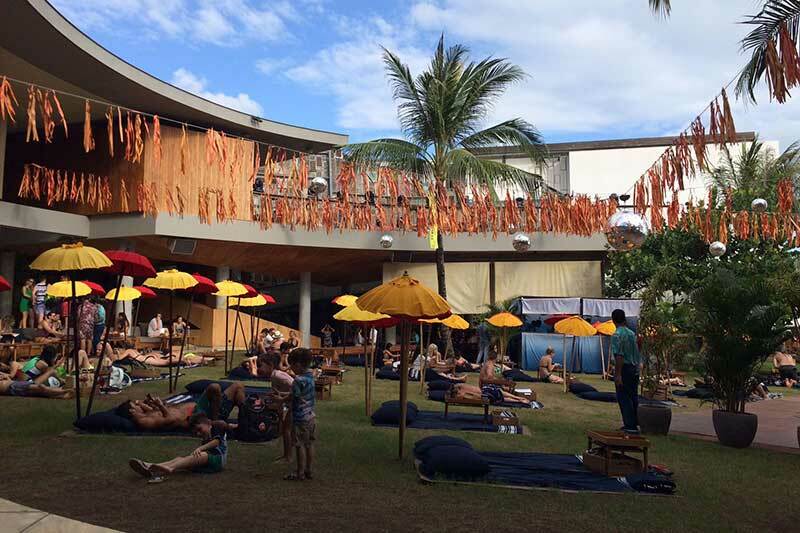 Get a taxi from the airport straight to Potato Head beach resort in Seminyak. This is the perfect way to start your 7 day Bali itinerary. You’ll be able to chill on bean bags and gaze out over the infinity pool overlooking the Indian Ocean. The taxi companies inside the airport charge an absolute fortune to get even the shortest possible distance. I would strongly recommend organising a transfer with one of the beach resorts. Most of the beach resorts offer shuttle buses to their resorts for free. Buy a beer or seven and relax your way through the inevitable jet lag and achiness you’ll be feeling after your flight into Bali. The beach resorts in Seminyak all have everything you’ll need for a complete day of preparation for your adventure in Bali. It’s a packed 7-day itinerary so you’re going to need this to cope with the following week. After spending all day in Potato Head, or another one of Seminyak’s famous beach clubs, I highly recommend staying at Meriki Apartment..
Get up nice and early and grab a taxi to the famous Tanah Lot temple to the north of Canggu. 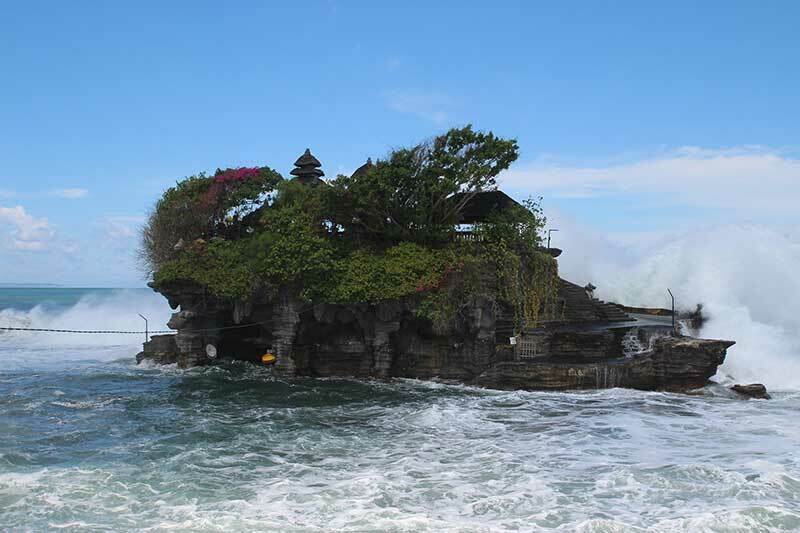 I’m not a big temple person but Tanah Lot sticks out as one of the best. Built onto a rock slightly out to sea, the pictures you can get are the sort you’ll put on your wall for sure. There might be quite a few people in the way to get the perfect picture, but you can always hope! After Tanah Lot drive back down to Canggu and pop into one of the many surf schools and book yourself a lesson. The surf in Canggu can be around an intermediate level but don’t let that put you off. Just make sure that you don’t go alone and that you definitely have an instructor if you’re a beginner. The perfect way to ruin your 7 days in Bali is to get into trouble by not taking precautions. We highly recommend booking a surf lesson if you’re a beginner. In the afternoon/evening find out which markets are up and running on your particular day. Your options are La Laguna night market, Love Anchor, Samadi or Old Mans. I’ve linked to all of the markets pages so choose the one that’s best for you. I highly recommend La Laguna so if you plan your trip to get to Canggu when that is running then you wouldn’t regret it. You can pick up all sorts of things in the Balinese markets. Canggu is ridiculously good for eating out so I couldn’t possibly recommend the best place to go. If you want to watch the sunset over the Indian Ocean whilst having a beer and a nice meal then the best is probably La Brisa. Carry on from where you left off in La Brisa and watch the sunset and enjoy the nightlife. I am in Canggu as I’m writing this and so many of my friends are packing up their stuff and moving to Base Hostel. I’ve been down and seen some of their rooms and for the price, it will be hard, if not impossible to beat. I highly recommend checking in to Base for the night. 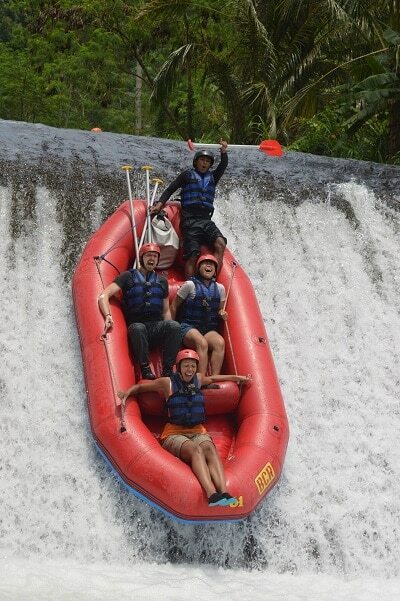 Before you leave your home country, book a white water rafting tour in the Telaja Waja River north of Ubud. They will then pick you up from your hotel in Canggu nice and early and ferry you off to the top of the river. The scenery was this beautiful throughout the whole experience. 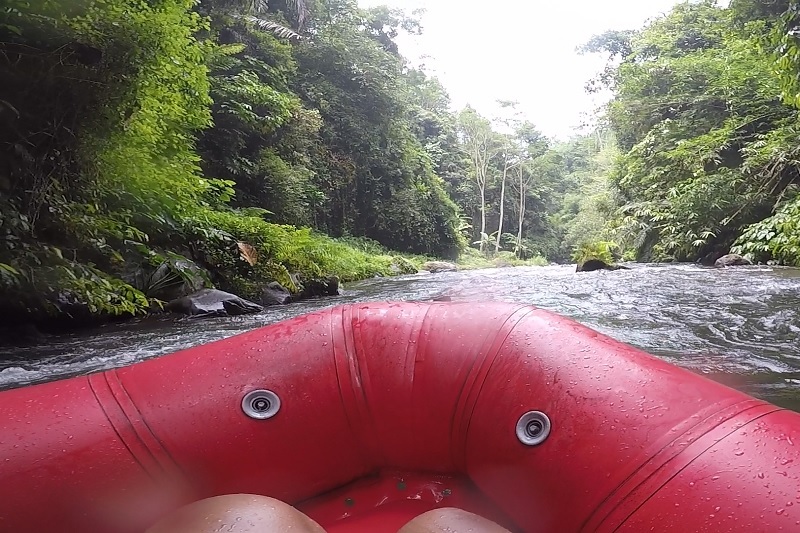 You make your way downstream for over an hour rafting through some of the most beautiful rainforest canyons you could possibly imagine. You have to duck under makeshift wooden bridges and have the opportunity to jump off ledges into the water at certain pools. The highlight has to be going over a 4m weir right at the end and plunging into the pool below. I wore walking boots, my friend wore nothing and Jade wore water shoes. My boots stank of stale water for weeks after, my friend cut the bottom of his foot when he fell out and Jade laughed at us throughout. Wear water shoe people! It feels a lot further than it is when you’re in the raft! After the rafting, they organise a buffet lunch and ferry you back to wherever you need to go. In this case, you’ll have to let them know you won’t be going back to the same hotel but in fact you’ll be going to Ubud, right in the heart of Bali. After dropping your stuff off at your hotel, make your way to the sacred monkey forest. The monkeys at the monkey forest have literally grown up around humans so they are not afraid of you whatsoever. They are also completely wild, in the sense that they can leave whenever they want. This family shows just how relaxed the monkeys are around humans. If you approach one or a group then if you want they will come over and climb on you so you can get some cool pictures of you holding a sacred monkey. They used to sell bananas that you held above your head to get the monkeys to run up your body. Now they don’t but the monkeys have learnt that if you put your hand above your head then this is the cue to run over and have a climb. If you don’t really want them to come over to you it is very easy to avoid that. They won’t climb over you if you don’t open yourself up to that happening. 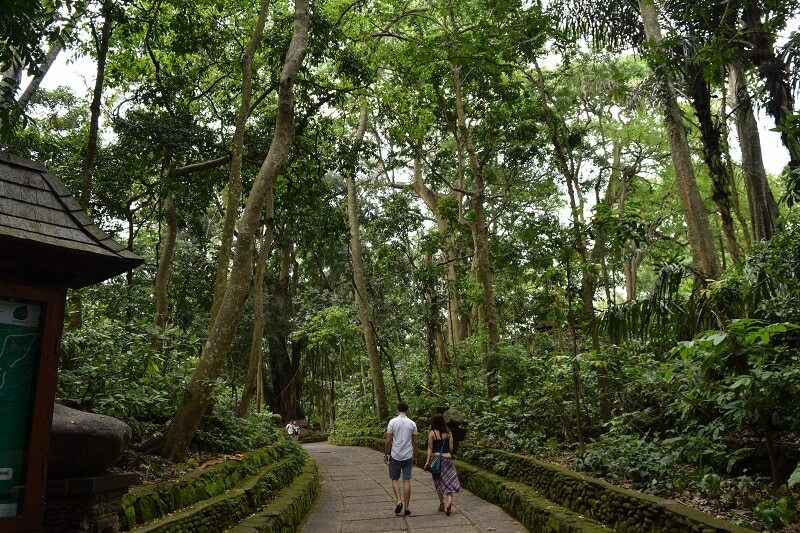 You can easily spend a couple of hours in the sacred monkey forest; it’s a very nice walk even if you don’t really like monkeys. For dinner take a walk away from the town centre and walk in amongst the rice terraces. Down these beautiful winding roads, there are some of the best restaurants and warungs in the whole of Ubud. 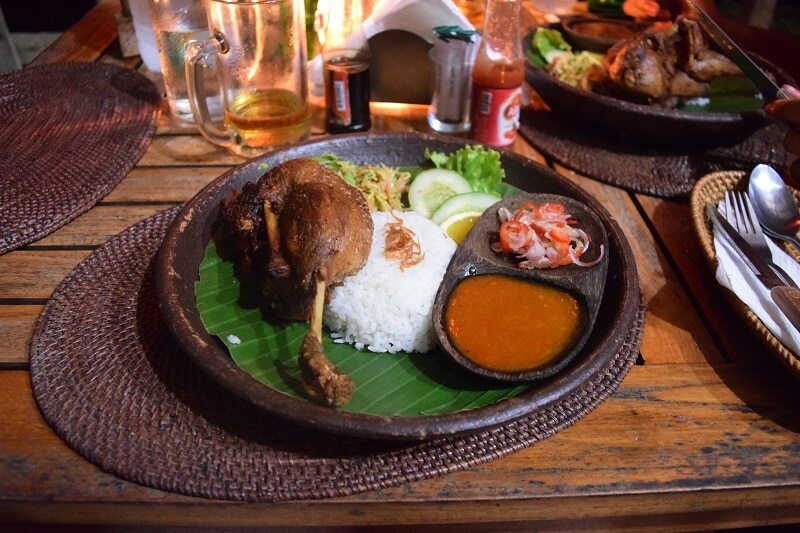 You can order some slow cooked duck and a Bintang and watch the sunset over the rice paddies. So by this point, you’ll be over halfway in your 1 week Bali itinerary but rest assured the best is yet to come! Slow cooked duck with rice and veg, beautiful after the sunset. If you are looking for either a private room or a dorm room then take a look at Puri Garden. It has the ‘Bali vibe’ that everyone wants in accommodation and you can’t go wrong. Click Here For The Best Hotel in Ubud! 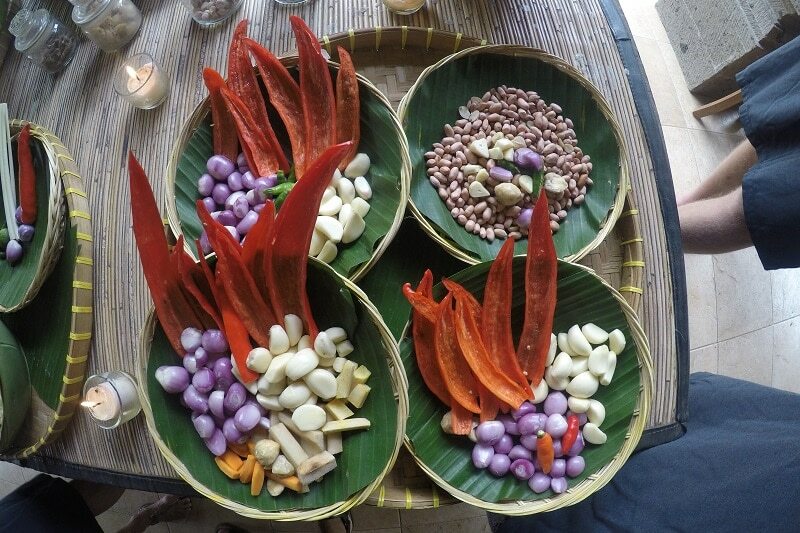 Book a Balinese cooking class before you leave and you will be picked up from your hotel in Ubud at 8am. We went to Lobong Cooking School and I cannot recommend them enough. After picking you up you will be ferried off to a local market and taken around the different stalls looking and purchasing ingredients for the days cooking. This really gives you the opportunity to experience what life is like for the local Balinese people and not just the tourist destinations. The class is so hands-on and you get to eat everything you have personally prepared throughout the day. This is where Lobong Cooking School really stands out because so many cooking schools around Asia, are simply watch and learn. On any of the cooking schools, you will be inside of a traditional Balinese home, complete with a personal temple. Before cooking they take you around the grounds for you to experience how they live. They will ask if any of the women present are on their period, if you are on your period then they will politely ask if you do not go into the temple. Don’t be offended as this isn’t specifically due to periods but any bleeding at all. You will finish the cooking class at around 2pm where they will drop you off back at your hotel or in the heart of Ubud. I think this is then the perfect day to really get away from the towns and experience some real remote Balinese culture. We all come to Bali to relax and soak up an atmosphere that we are missing from our day to day lives back home. The locals are difficult to barter with but it’s all pretty fun. Make your way out into the countryside with some locals and watch fireflies dancing in the night. You will be served some absolutely amazing local cuisine, as authentic as it comes, and get a chance to relax a little before tomorrow’s very early start. Day 5 is going to be a really early morning, 2am, so feel free to not go out into the firefly paddies if you think you’re going to need an early night! I would recommend staying in whatever hotel you were in the night before. No point in having to move all of your things from place to place if you don’t have to. There are really very few places in the world that allow you to see such a beautiful sunrise on top of an active volcano. 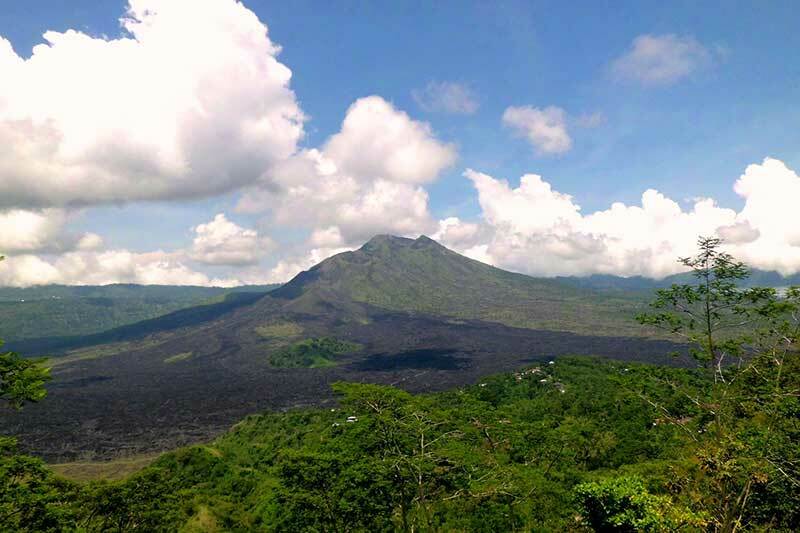 Mt Batur is one of those places. You really would be silly to miss such an epic experience. You will be picked up from your accommodation at around 2am and be driven to the village at the bottom of the mountain. The views from Mt Batur look even more incredible at sunrise. Sleep on the car ride there! Not really a pro tip but close your eyes and make the most of when you’re not in the car. From there you will walk up to the peak in time to watch the sunrise over the island of Bali. You will even be able to see the lava from the crater itself! If that wasn’t enough then you will be taken to some local hot springs where you will be given time to soak away your aches and pains from the morning activities and maybe even wake yourself up a bit! Eventually, you’ll be taken back down to Ubud where you will be dropped off at a place of your choosing. This will be around 1pm. I would suggest then taking a taxi back down to Kuta and checking yourself into one of the more luxurious hotels in town for a couple of nights. The accommodation in Bali is so affordable that it would be a crime not to book yourself into a luxury resort for a fraction of the amount it would cost elsewhere. You just can’t say no to this sort of luxury when you’re in Bali. We stayed in a hotel called Amnaya Resort on our way back and it was simply divine. 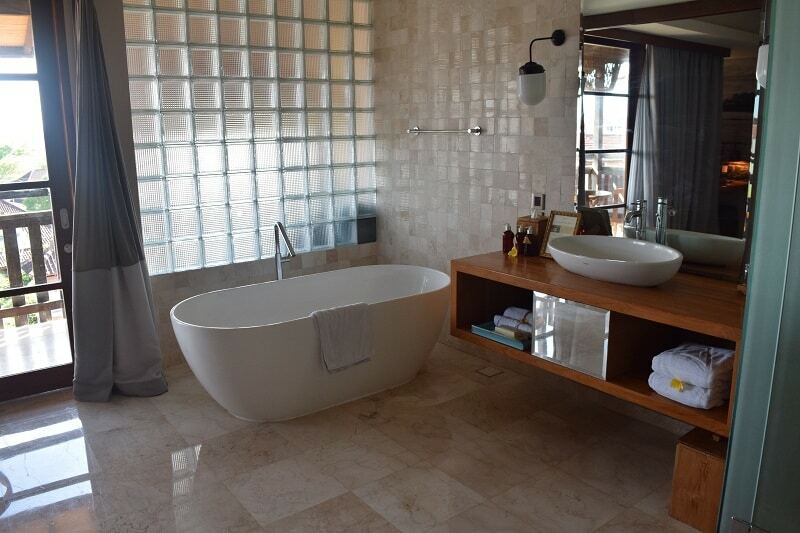 You can get a free standing bath in your room and the restaurant and pool on site are exceptional. This might be a good time to get a Balinese massage or some spa treatment, either in the hotel or at any of the small outlets all over Kuta. It will be a lot cheaper in a small outlet but you can’t really beat a luxury resort Balinese massage for quality and relaxation. 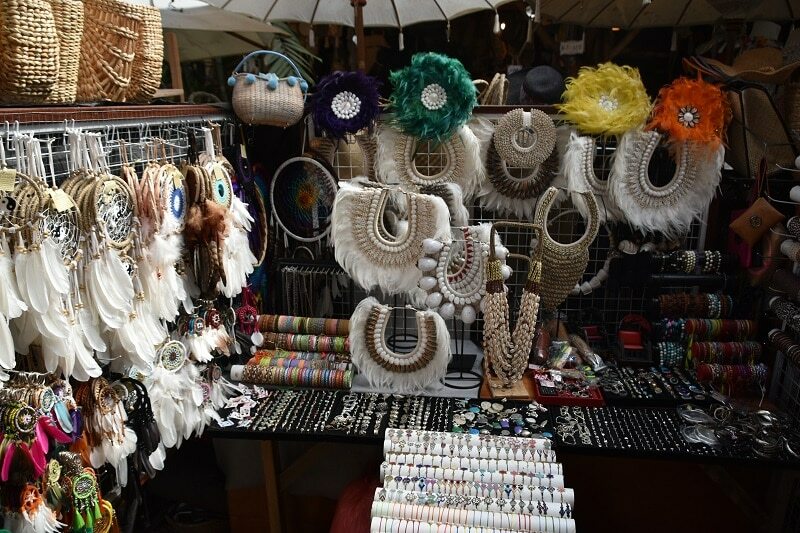 If you feel pretty fresh and up for some more activities in Ubud before you head down to Kuta then check out the Ubud market. This long sprawling market has everything you could possibly want and you get to have a bit of fun bartering the ridiculous prices that the locals throw at you. You’re almost certainly going to fall asleep in the afternoon because of the ridiculously early morning but don’t worry, you’re going to need it for the following day. Fun Fact! 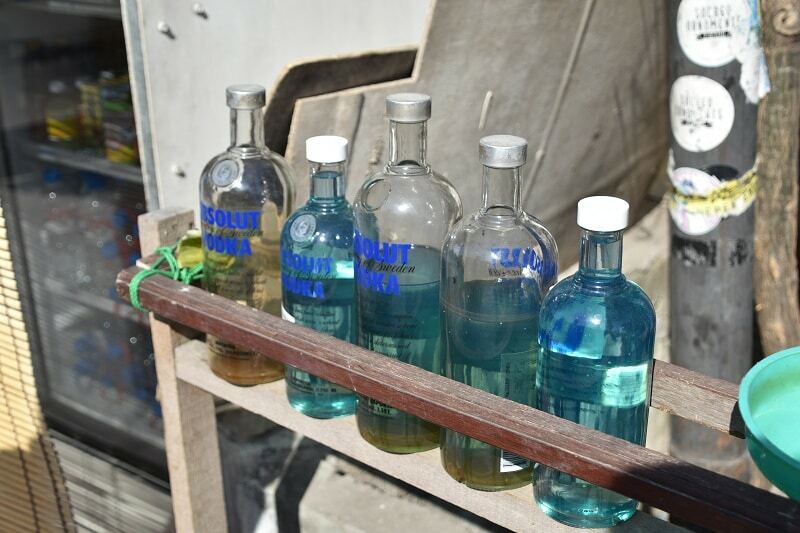 This is how they store, sell and refill petrol to their scooters all over Bali. Now you’re back in Kuta you have to go to Waterbom. Rated as one of the best water parks in the whole of Asia, this is a must visit whilst in Kuta. This is a whole day activity and, believe me, you will be more than satisfied by the end of the day. It’s not fear in my eyes I swear! At around 4pm every day all of the bakery goods throughout the park go to half price until the park closes. Wait till then to fill your face with all the cakes and muffins you could want. By the end of Waterbom, you won’t have any energy left to explore any more of Kuta. If by some miracle you do then avoid the main strips as they are catered very much to people who just want to get drunk and party. If that’s your thing then knock yourself out. Remember your flight is the next day! Take your action camera! 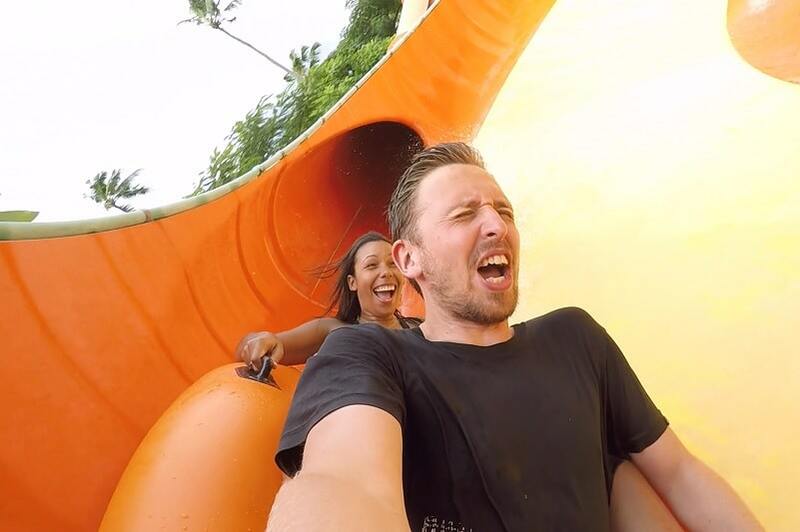 They are one of the only big waterparks I have ever been to that allow you to take action cameras on some of the biggest slides (not all of them). Don’t miss out on getting some epic videos. Stay wherever you booked on day 5 to save yourself the trouble of moving. Depending on your flight, the last day of your 7 days in Bali will be spent biding time until you have to be at the airport. 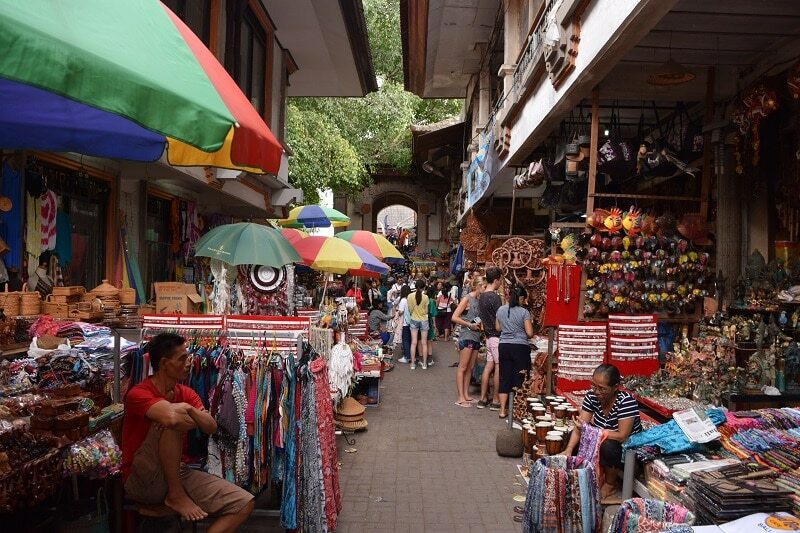 Either way, there are some very good alleyways and back streets in Kuta with much nicer and cheaper food as well as some really nice shops for souvenirs and gifts. 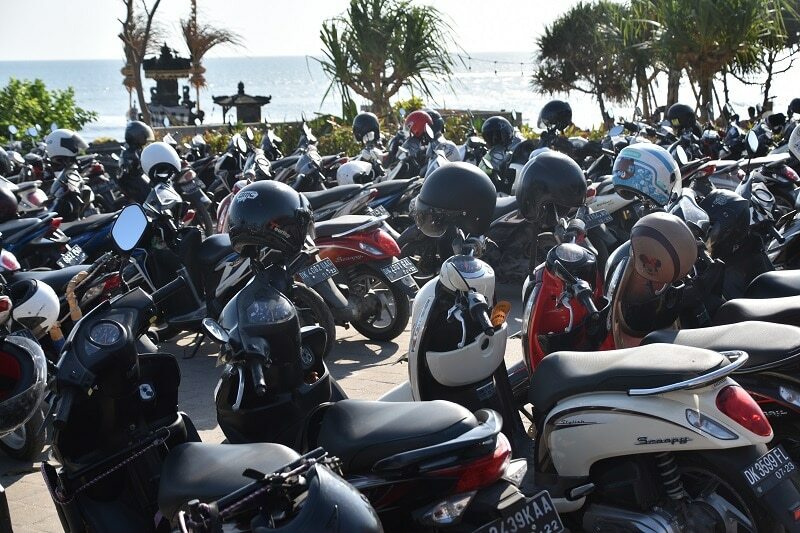 You’ll get used to seeing thousands of bikes during your week in Bali! 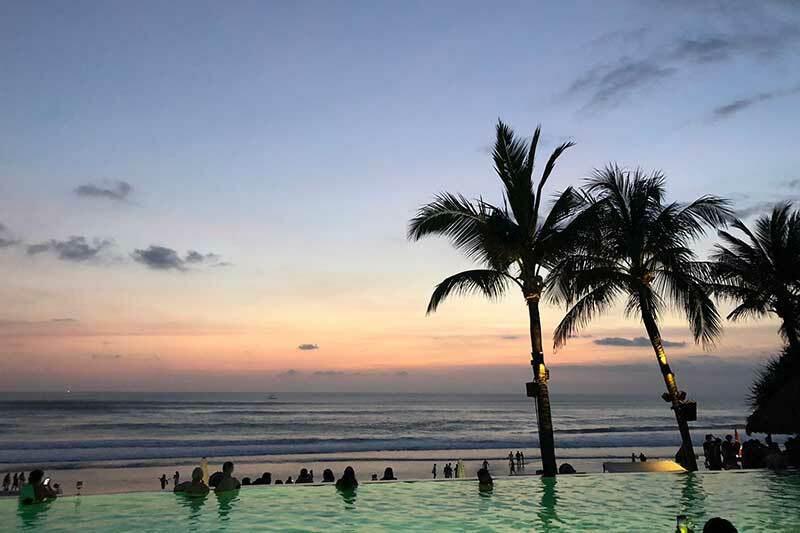 If you haven’t already maxed out your luggage space with memories and gifts then Kuta is a great place to wander around until you have fulfilled your quota. If you’re about to buy something from a local then do some research into how much it would cost back home. I thought $9 for an Uno card set was pretty good but apparently, it’s not. Maybe that’s just my own idiocy but nevertheless, be prepared! After this packed week full of early starts and late nights you’re going to leave Bali with memories galore and pictures to remember them by. I highly recommend checking yourself into Premier Lounge at Ngurah Rai airport before your flight. After you’ve bought yourself a meal and a drink in the terminal then you’ll probably have spent more money than what this lounge would cost ($22). With AC, buffet, showers and drinks all complimentary, I really can’t see a better way to prepare you for an international flight. Bali is a great place to visit if you’re on a budget but if you want to splash out a little on your way home then a lounge is a great idea! I think it is just enough time to experience Bali. We would always like more time and if you can go longer then why not. With this itinerary, I think you can see enough to get a good feel for the Bali. Local shops do not accept US dollars throughout Bali, you can, however, change dollars into IRP at many exchanges throughout the Island. The exchange rate offered by these exchanges is also relatively good compared to other countries. It is recommended to make sure you are up to date with all vaccinations, please click HERE for more information about vaccinations and real medical advice. If you are staying for 30 days or less then there is a list of countries HERE that do not require a visa. If you require longer then a visa will be necessary unless you leave the country and return once a month. Indonesian primarily, however, a small minority still retain the original Balinese language.